Horse eating from feeder filled with hay. Feeding and watering your horse can take many hours out of your day, become very tiring, and can affect your personal schedule to the extent that you don't feel free to come and go and enjoy life as you should. By taking into consideration the horse's natural grazing tendencies and developing an effective program to manage feeding and watering, you take care of your horse in a more natural way without having to devote extraordinary amounts of time to the task. In the natural state, horses spend up to 60% of their time wandering and grazing as they come across edible plants while staying as close as possible to natural sources of water. 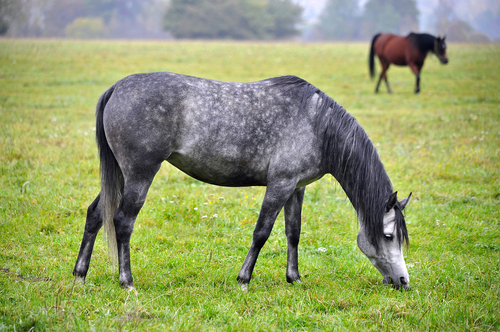 Horses able to graze in a more natural setting have fewer health and behavior problems as compared to stabled horses. Unfortunately, in the domesticated state, horses are often deprived of the natural ways of eating and drinking. Studies show that horses are healthier, have fewer bouts with colic, and have improved absorption of nutrients that can influence bone density and health when they are fed smaller amounts of feed at 2 to 4 hour intervals throughout the day. In addition, the typical horse kept in a stall with nothing to chew on will often develop stereotypical behaviors such as stall walking, wood chewing, cribbing and other behaviors that are unhealthy and detrimental to the horse's environment. Keeping these facts in mind, it is important that you develop a feeding program for your horse or horses that allows "grazing time." If your horses have access to pasture during most of the year, that's definitely a plus. If you live in a cold climate or are in a situation where your horse must spend much of the time in a stall, your work is cut out for you. Your first step will be to write down the food requirements for each of your horses. You may do this on a whiteboard located near the feed storage area or in a notebook or wherever it is convenient for you, but make sure it is accessible to other people who might be feeding the horses when you are not around. Nest, determine whether you want to go with a relatively simple system such as a production assembly-line bag system where you put together up to several days rations for each horse in bags to be hung on each stall door, or do you want to invest in hay nets or a programmable, fully automated system. Plenty of information is available on the internet regarding commercial feeding systems, or you can check with your local feed store for innovative ways to feed your horses more efficiently. 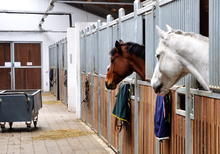 Horses become anxious during feed times. 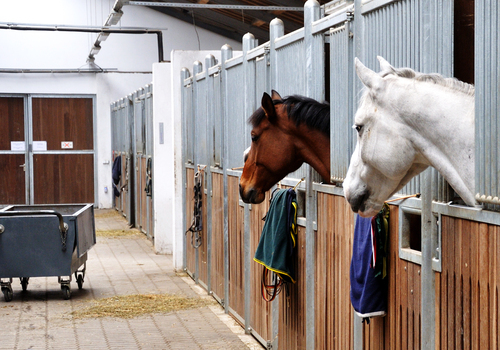 Developing a feeding routine helps horses cope with waiting. A number of commercial companies have developed feeding methods and products that can simplify feeding your horse in a more natural way. These products range from hay net bags that are filled with the amount of hay a horse would consume in a day to highly technical automatic feeders for grain and hay. These systems are usually comprised of pipes, bins and chutes with a timing mechanism that can be programmed to release certain amounts of hay, grain, and supplements to each horse up to eight times a day. A number of horse owners use a system similar to the assembly-line preparation of kid's school lunches. Several bags that can hold a feedings worth of hay, grain, and/or supplements are purchased for each horse. These bags are filled with the correct amount of feed and hung on the stall door of that horse. Any one capable of getting the correct amount of feed into the bags can fill them at a convenient time and hang them on the stall doors for later feedings. To simplify the process and save time, a horse-proof piece of pipe or tubing to make a chute is installed in the stall wall or door so that when feeding time comes, the feed is simply dumped through the chute into the bucket or feeder in the stall. This kind of feeding means that one simply has to walk past each stall, empty the bag into the chute, and the horse is fed. Even a child can successfully feed a horse in this way. Often seen in racing barns, hay nets provide free-choice feeding to alleviate the bordom of stall living. In the case of the hay net system, strong nylon mesh bags hold up to 35 pounds of hay. These bags can be mounted on a fence, a stall wall, or a post. Although this illustration shows the hay net at the level of the horse's head, equine nutritionists usually recommend that horses be allowed to feed with their heads down as they would while grazing in a pasture. The hay nets are constructed in such a way that the horse has to get its tongue around bits of hay and extract the bits of hay from the net. 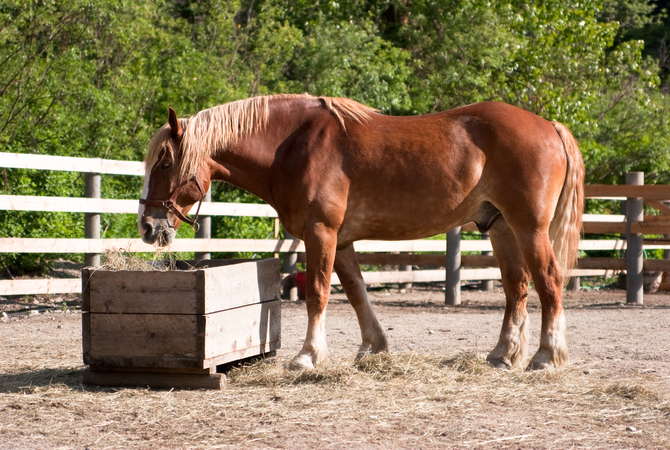 This takes time and allows the horse to feed naturally 24/7 through a simple "restricted free access feeding" program. 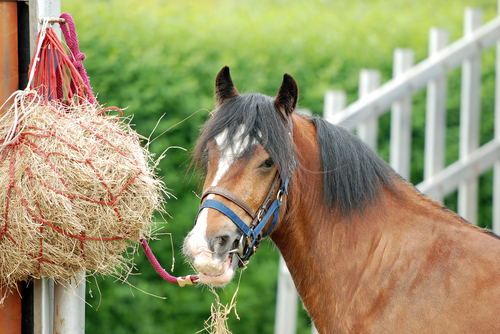 If several horses are in the same area, it is suggested that one extra hay net system be installed. This way, if the alpha horse crowds out another horse, that horse can simply go to another hay net to continue feeding. Other more fully automated systems are usually programmed so that feed passes through a hopper into an overhead circuit of steel tubing. A cable fitted with molded plastic disks moves the feed throughout the barn to the individual containers in each stall or feed drop. When all the feed drops are filled, that system shuts down until a timer releases the feed for consumption by the horse. Other automatic systems for grain and hay are comprised of bins with a timing mechanism that is capable of feeding flaked, pelleted or chopped hay, grain, and/or supplements up to six times a day. The bins are usually attached to the stall door for easy loading and use digital clock programming powered by regular flash-light type batteries which can typically work for 6 to 12 months, eliminating the need for electrical wiring and relieving power outage concerns. Most of these feeding systems permit the operator to set controls for the amount, time and frequency of feeding thereby relieving the labor-intensive demands of frequent measured feeding that often make such a feeding program prohibitive. 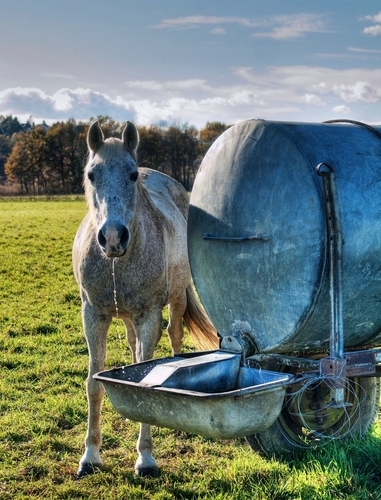 A large range pasture requires a movable water truck to provide fresh water for the horses. Horses need access to fresh, clean water at all time. A typical horse should consume around 10 gallons of water a day. Without the necessary water, horses become dehydrated and prone to a number of illnesses such as impaction colic. The needs of individual horses vary widely and are affected by general weather conditions, the size of the horse, the type of feed, the activity level, and the general health of the horse. Fortunately, many designers of horse waterers have developed products that will provide your horse with the necessary quantities of clean, fresh water with very little effort on your part. Although watering troughs or buckets that are filled, drained, and cleaned by hand meet the needs of many horse owners, the use of automatic waterers will cut down on labor and be more efficient in supplying your horse's water needs. Rule out labor-intensive waterers and those that are uninviting to horses. A careful evaluation of what is available and how each waterer might meet your needs is very important. The right method of watering your horses will not only provide them with fresh, clean water month in and month out, but will save you time, money and effort in the long run. Feeding your horses in the most natural way possible and making sure they have access to plenty of fresh, clean water 24/7 need not be an all-consuming task. With a well-thought out system, you can "get on with your life" while knowing that your horses' needs are being met in the most effective and efficient way possible.